This is an ADD-ON option to the Ladies Peplum Top which must be purchased separately. Peplum Top: Features a fitted knit t-shirt with 6 sleeve lengths. Skater Skirt: Add a curved, flared skirt to the natural waistline of the peplum top -- with EIGHT length options. 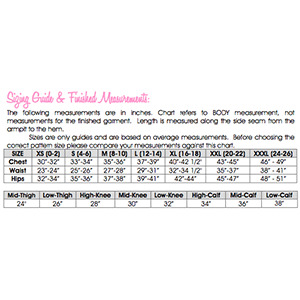 Lengths included: mid-thigh, low-thigh, high-knee, mid-knee, low-knee, high-calf, mid-calf, low-calf. Recommended fabrics are knits with at least 75% stretch such as cotton lycra or lycra spandex.